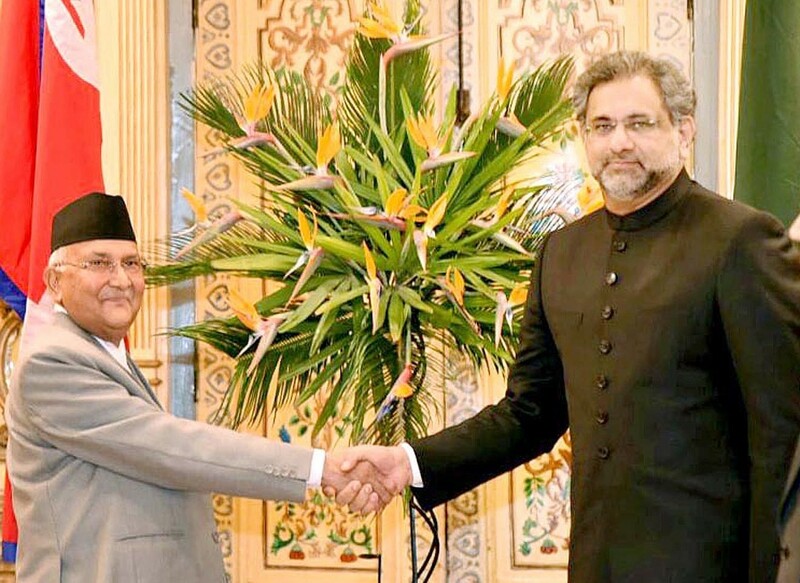 KATHMANDU: Prime Minister (PM) Shahid Khaqan Abbasi and Nepalese PM Khadga Prasad Sharma Oli met here on Monday and agreed to enhance cooperation between the two countries in areas of economy, defence and culture. PM Abbasi, who arrived in the Himalayan city to felicitate his Nepalese counterpart on assuming the office of prime minister, said Pakistan welcomed the completion of the democratic process in Nepal and hoped that it would usher in an era of durable peace in the region. Abbasi said Pakistan fully supported Nepal’s unity, sovereignty and territorial integrity as a matter of prime importance. He said it was heartening to see that the democratic culture in Nepal was flourishing and emphasised that political stability was a key to economic development. He said Pakistan and Nepal had remained good friends over the decades and both the countries could further strengthen existing ties by collaborating in the fields of culture, tourism, sports and education. The two leaders discussed South Asian Association for Regional Cooperation (SAARC) as an important platform to explore areas of cooperation among regional countries for the benefit of their respective populations. It was also highlighted during the meeting that the economic relations did not match the political will existing between Pakistan and Nepal and thus needed to be further strengthened. The two leaders emphasised the need to reactivate Pakistan Nepal Joint Economic Commission and the Joint Business Council to increase bilateral trade. It was also agreed to strengthen people-to-people contacts through different platforms. Both the leaders expressed satisfaction over the scope of cooperation between the two countries at the international level. Later in the evening, Abbasi attended a banquet dinner hosted in his honour by Oli. The banquet was joined by senior officials of the Nepalese government and Pakistani delegates. Both the leaders led delegation-level talks on the occasion to discuss future cooperation between both the countries.